Despite the current trend toward gardening with native plants, there are many species out there that have yet to get the attention they deserve. Case in point: our native azaleas. Mainly indigenous to the southeastern United States, these azaleas are considered by some authorities to be the most beautiful of all our native shrubs. It's no big mystery why the native azaleas have so far been kept in the shadows. The enormous popularity of Asian species has created in the minds of many a standard for what azaleas should be: spring blooming, low, mounding, evergreen, and custom-built for foundation plantings. Native azaleas are few of these things. For one, they lose their leaves in the fall. Rather than being low and dense, some native azaleas grow quite tall and airy. They shouldn't be pruned, as it spoils their naturally graceful habit. The vivid flower colors of the hybrid Asians are not usually found in the natives. And not all of the native species bloom in spring. However, native azaleas have their own virtues. The trick to designing with these plants is not to consider them substitutes for the Asian azaleas, but rather to see them in their own right as showy spring- and summer-flowering shrubs with softer colors and more natural growth habits. Native azaleas allow you to extend your flowering display throughout the growing season. Indeed, for every month of the spring and summer, there is usually at least one native azalea aglow with inflorescence. Some, such as the plumleaf azalea (Rhododendron prunifolium), flower as late as August or even into September. Typically the flowers, which appear at the tips of the branches, are pink or white and tube-shaped, with flaring petals and long, showy stamens. What's more, when the flowering season draws to a close, a few of the native azaleas, such as the pinxter-bloom (R. perclymenoides), extend the season even further with their colorful displays of fall foliage. Native azaleas are woodland plants. They prefer high, dappled shade, plentiful moisture with excellent drainage, and a humus-rich, acid soil. They do well in cultivation, however. Whereas in the forest they bloom irregularly due to sporadic sunlight, when grown in light shade in mid-Atlantic gardens, they grow faster, leaf out better, and flower more evenly and profusely. They can even thrive in areas where exotics wouldn't survive, like troublesome wet spots. As an added bonus, native azaleas are low-maintenance and relatively free of pest and disease problems. And cultivating native plants gives a regional feeling to a garden, blending the natural history of the area into your site. 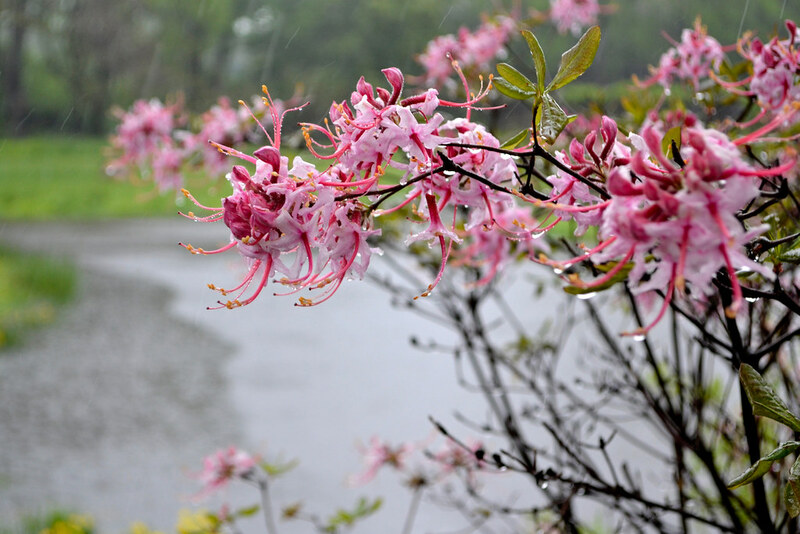 Early bloomers like the pinkshell azalea (R. vaseyi) and the mayflower azalea (R. austrinum)—which both flower before leafing out—need a dark background such as a wall, hedge, or large evergreen to set off their blooms. Or they can be planted in masses so that their pale flowers combine in the form and color of a cloud. The pinxterbloom azalea, R. perclymenoides, is often the first of the native azaleas to flower, bearing clusters of short, fragrant, light pink to white blossoms. It ranges from four to six feet high and is useful for naturalizing in woodland gardens. Although it doesn't stand out as much as some of the other natives, it is a familiar sight in woodlands all over the Northeast. Perhaps the best ornamental feature of this species for the home garden is the fall foliage, which turns a glowing orange-red with overtones of burgundy and purple. Another early bloomer is R. canescens, the Piedmont azalea. Although it is generally found along streams and in other moist areas, it will grow under drier conditions and even take full sun. Give it room, because it can grow up to eight feet tall in some regions. Flowers range in color from white to deep rose-pink. Its delicate, sweet fragrance makes this species a favorite of many native-shrub enthusiasts. 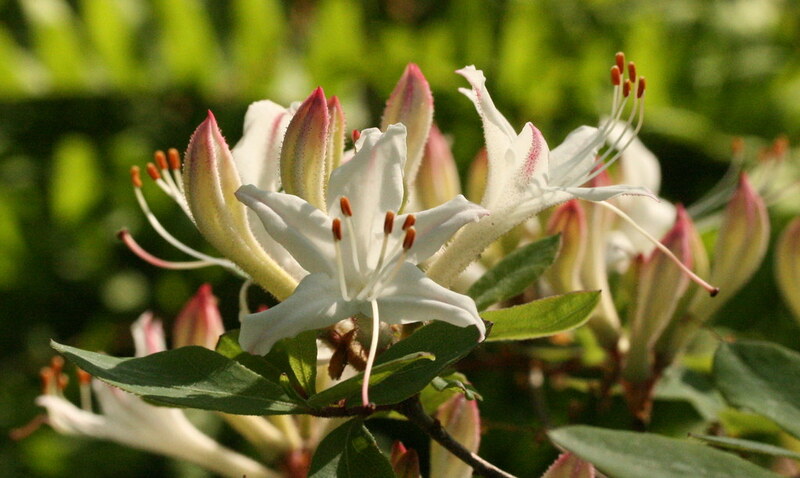 The Piedmont azalea is perfect for naturalizing in open moist woods along a trail planted with early wildflowers. It is a plant to lift the spirits. The mayflower azalea, R. austrinum, is one of the easiest of the natives to grow. And it's a dazzler! The six-foot-high shrub smothers itself with golden-orange flowers, which glow like sunlight and fill the air with an enchanting fragrance. The leaves develop a yellow to maroon fall color. I suggested to my uncle Henry—a very fussy plantsman—that he try R. austrinum as a specimen by his garden bench. But after learning that the shrub is a magnet for swallowtails, gulf fritillaries, monarchs, hairstreaks, and skippers, as well as hummingbirds and bees, he's decided to plant it in abundance. One of the finest and most dependable early-flowering azaleas for moist to moderately dry landscapes is R. vaseyi, the pinkshell azalea. It provides a lovely display of bell-shaped, apple-blossom-pink flowers, which have reddish orange dots at the base of their upper petals. In fall, the foliage turns a deep, rich burgundy—it is considered to have the best fall color of all native azaleas. It usually grows no higher than five or six feet. All lovers of beautiful flowers should indulge themselves with this one. In mid-spring, many of the white-flowering azaleas are doing their thing. For example, the dwarf, or coastal, azalea, R. atlanticum, blooms heavily and sweetly around this time. A common understory plant in the pine barrens and moist woodlands along the southeastern coast, its leaves often have a bluish tinge. Growing from three to five feet high, the coastal azalea, as its name suggests, is good for massing in the sandy soils of a seaside woodland garden. But beware! It is stoloniferous and has a tendency to colonize. Planting the species in a heavier soil will help restrict its spreading habit. Back in the 18th century, the famous American horticulturist John Bartram described the flame azalea, R. calendulaceum, as the most brilliantly flowered shrub yet known. "Clusters of blossoms cover the shrubs in such incredible profusion of the hillsides," wrote Bartram, "that suddenly opening to view from dark shades, we are alarmed with the apprehension of the hill being set on fire." 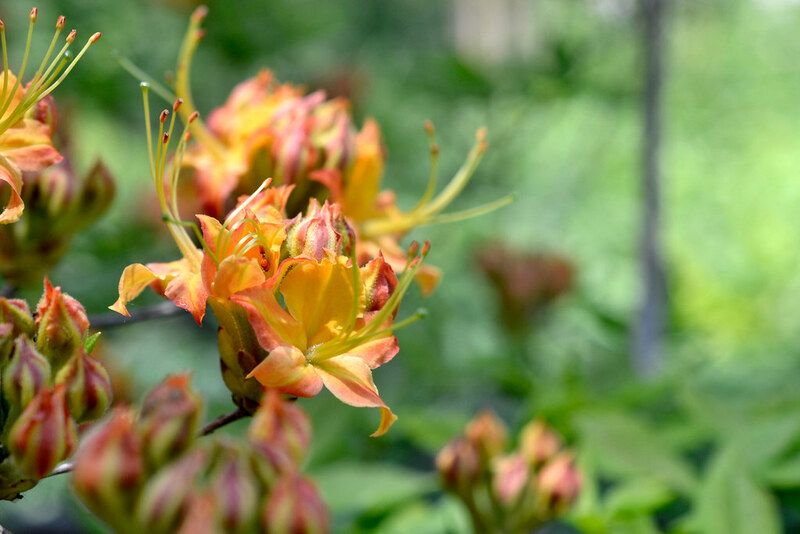 The flame azalea's flowers range from pale yellow to deep red-orange in color. They have no scent but are larger (one to two inches across) and showier than those of any other native azalea. Even the flower buds have ornamental appeal, each one resembling the flame of a candle. The plant grows slowly to eight feet and appreciates a cool place in high shade. Even on cloudy days, the flame azalea's flowers seem to glow from within. My favorite of the white-flowered azaleas is the sweet azalea, R. arborescens. This upright species is commonly seen in the high country from Pennsylvania to Georgia. Its funnel-shaped flowers have a very prominent, clovelike fragrance. Indeed, when hiking in the hills in summer, you're more likely to smell the plant before you see it. Fall foliage ranges in color from bright orange to crimson. Give the sweet azalea adequate moisture and a few hours of sunlight each day, and it'll be a consistent performer in your garden. The white swamp azalea, R. viscosum, is most commonly found in mountain wetlands from Florida to Maine. It's very similar to R. atlanticum, only taller (five feet high) and with spicier-scented flowers. Its foliage turns bronze in fall. The white swamp azalea tolerates extreme cold and is useful for planting in moist to wet areas; however, it can't handle drought conditions. R. prunifolium, the plumleaf azalea, is a graceful shrub for woodland conditions. Its vibrant red-orange to red flowers are a nectar source for swallowtail butterflies and hummingbirds. The plant is unique among azaleas because it blooms during the hottest months of the year. It's best to site this species in a cool, partially shaded area where the burning summer sun will not scorch or wilt the blossoms. It grows up to eight feet high and offers a yellowish to plum fall color. Given the proper site, native azaleas are long-lived, easy to care for, and present a stunning color display every year. I think you'll agree that they merit much wider use in our gardens. Never collect native azaleas from the wild, unless you’re trying to save them from impending road construction or similar development. Apart from the ethical considerations, wild-harvested azaleas perform poorly, and their survival rate is low. Richard L. Bitner , an anesthesiologist by trade, lectures on deciduous flowering plants at Longwood Gardens and is a member of the Pennsylvania Horticultural Society's Gold Medal Plant Award Committee. Rhododendron calendulaceum (flame azalea) in the Native Flora Garden. Photo by Blanca Begert. Rhododendron periclymenoides (pinxterbloom azalea) in the Native Flora Garden. Photo by Blanca Begert.